Keeping your diesel fuel free from water and other contamination is fundamental to ensuring the smooth operation of your engine when you need it most and prolonging its service life. We are pleased; working in association with Landau UK to bring an innovative new product to the Scottish boating market which will help deal with this ever increasing problem whether its on a fishing boat or luxury yacht. Any contamination of the fuel be it water, sand, rust or general dirt can be incredibly damaging to diesel engines, especially those fitted with the newest generation of electronically controlled high pressure fuel injection systems. Water is especially troubling as it is easily introduced to a fuel system in the marine environment and will cause serious reliability issues possibly putting lives in danger. The MLS Fuel Purifier (FP) will remove water and solid particulates from even the dirtiest, most contaminated fuel. When fitted in conjunction with a conventional fuel water separator, they will work together to ensure that your engine is protected from harmful water and particles. 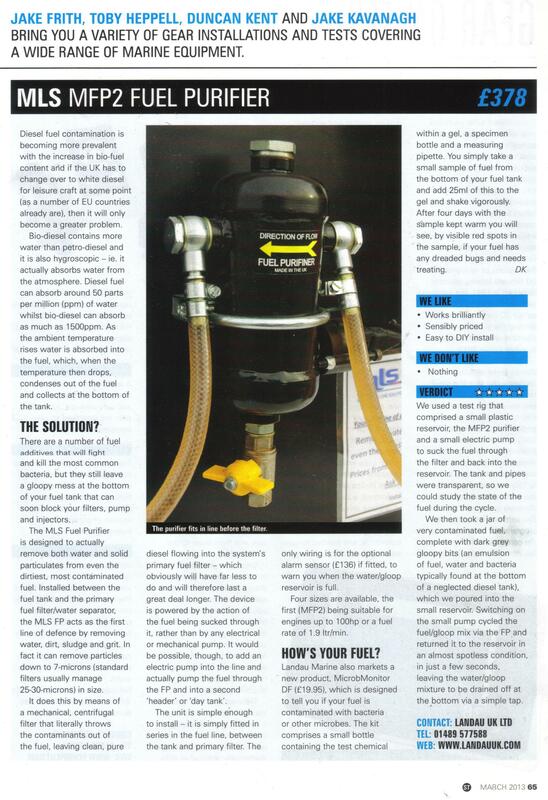 The FP acts as the 'first line of defence' plumbed in the fuel line before the vessels existing primary fuel filters and in tests the units have been shown to remove up to 99% of water and 97% of diesel bug contaminates from diesel. The unit therefore leaves the primary filter to deal with only the smallest amount of fuel contamination; dramatically increasing the expected service life of the filter element. The system was tested by the Sailing Today team in March 2013, receiving a great 5 star review with no negative comments. Read the review here or watch the demonstration video below to fully appreciate the benefits of this simple yet highly effective product. Significantly increased service life of all fuel filter elements down stream of the unit. Extended service life of engine fuel system components including injection pumps and injectors. Maintaining of engine exhaust emission levels over service life of engine. The units are supplied as an easy to install kit suitable for DIY or professional installation; complete with all required mounting brackets and hose connections to plumb straight into the existing fuel system. Available in a range of sizes to suit engines from 7hp to 4000hp a solution is available for any vessel. An optional sensor kit can be fitted to any of the units which will indicate when draining off is required, a valuable service reminder. For pricing of larger units or to discuss your requirements in more detail contact our chandlery staff in Ardfern or Tarbert to discuss your requirements.